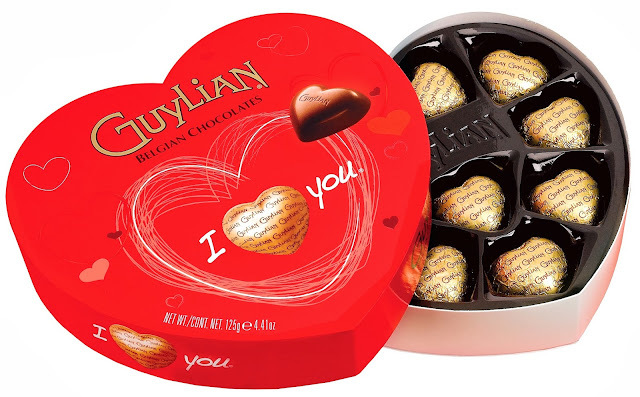 Valentine's Day seems to creep up on us very quickly after Christmas and the New Year, so to offer a helping hand Guylian have kindly provided several boxes of their I Love You chocolates to giveaway. A delicious treat for a loved one this February. Each chocolate within the heart shaped box is individually wrapped in golden foil for freshness and a touch of elegance. Filled with roasted hazelnut praline these are the perfect gift this Valentine's Day for anyone with a sweet tooth! The smaller 50g box contains four hearts and the larger 125g box (pictured) is a slightly more substantial present. Guylian Valentine's chocolates are available in all major supermarkets. For your chance to win 1 of 3 boxes of Guylian 'I Love You' Valentine's chocolates you can enter via the Rafflecopter entry form below. You can purchase Guylian chocolates from their website. I'm a single mum so I will be enjoying Valentines with my children and pets, who are all the loves of my life! I'm thinking of cooking a romantic meal at home! Just a nice meal at home! I'll be curled up with a good book! I haven't any plans, maybe I'll be surprised! No plans for Valentines day (I'm very happily single), might give the cat a hug though :) I follow on Bloglovin'. Nothing special but maybe open some champagne! I don't have any plans but I'll actually be on holiday on Valentines Day, yay! I love chocolates and flowers, but I prefer spontaneous gifts that are unexpected. I hate all of that mushy forced valentines day stuff. It's the small everyday gestures that count, not the big flamboyant shows! Gosh, do I sound like a valentines version of Scrooge? I'll cook us a special meal at home. No plans. Probably have a curry and a beer. I'll be at home doing normal stuff trying to forget that it is Valentine's day. We will get a takeaway and share it with our children. We will be going out for dinner this year :) have some time out from the kids. Maybe go for a stroll along the beach afterwards if its not snowing!!! We save the money and take a post holiday later in the year. A quiet meal for two, cooked by myself I think! As I am single and very happy I will spend Valentines day on my own and indulge in some lovely treats for myself. Gosh don't know hopefully I'll have a nice surprise! To take hubby out for a surprise meal to our favourite restaurant. As it's my 45th birthday on the 13th, I'll probably have a party on valentine's night and celebrate both dates with my family and friends. its my partners birthday so after we put our son to bed, we'll get a takeaway and watch a movie! Nice dinner at home and dvd! It's also my birthday! I'm hoping hubby will be surprising me with something nice. I follow on Google + as Ali Thorpe. I follow on Bloglovin as Ali Thorpe. OH is working so a soppy film then bed! Hopefully go for a meal out (with our boys staying at their grandparents). Plans? Um, haven't made any. Probably just another day, it's all a bit daft isn't it? Marketing nonsense mostly. I haven't quite made any valentine day plans but i reckon it'll be like any other night - some TV and an early night - the romantic in me died a long time ago! On my own in the dark crying and eating chocolate. Lol! Okay probably just doing nothing in particular. I follow on Google+, Pinterest (izpants) and Bloglovin. not sure yet - depends if we can get a babysitter! I'm single so I will probably buy myself a Cd & a take away so I don't need to cook or wash up! We are on a budget this year so we are going to make some homemade treats, my hubby had just mastered the art of fudge making so we are going to experiment with flavours. I will also be doing some Valentine theme crafts with my little girl.